If these reviewers are using an iPad like a laptop, I submit that it won’t be a good experience at all. People have to be able to use the software keyboard to maximize an iPad’s strengths. iOS has drag and drop in a lot of places, gestures all over the place, moving the text cursor in multiple touchscreen ways, using the Pencil in many different ways. This needs to be done with the iPad flat on a table, horizontal. Using all these touch gestures and Pencil while an iPad is vertical or in a clamshell style configuration with external keyboard is nuts. All that touchscreen stuff just won’t work that well because the iPad is not stable while vertical, and users have to lift their whole arms to perform precise gestures. If a lot of manipulation is being done, users will tire pretty quickly doing gestures onscreen. These tablets must be used flat on the table to maximize multi-touch usage and enable fine grained control of objects with your fingers. The CNBC’s reviewer’s list of things he or she does is: use corporate Slack, draft up a story in a web browser, use email, and edit photos, typically with all the programs running and switching between these apps. This is eminently doable on an iPad with the software keyboard. Slack, any timeline app, can be in Slide Over, web browsers, email, files and photo editors in various Split Views or full screen views. Switching, drag and drop, and text insertion control are all gesture based, and should be just as fast as a macOS trackpad. With vector graphics apps, like OmniGraffle or even Keynote, where a user is creating diagrams, positioning elements, etc, are better with the iPad flat on a table. Drawing and writing with the Pencil is orders of magnitude better with the iPad flat versus vertical. I use the apple cover w/ keyboard. So by your measure, I would be using the iPad as a laptop. When using the pencil I actually prefer it in the clamshell, I just slip the bottom of the iPad over the keyboard and now I have a nice ‘drafting’ table. When I’m walking around the class making notes and evaluating students after our conversations I use the pencil while holding the iPad sans keyboard. It’s nice, light, and portable. I definitely agree that using the pencil when the iPad in vertical is not ideal, but it does have it’s moments. If i need to make a few marks here or there on a students page I avoid moving the iPad and make the few marks with the pencil. The bottom line for me, and what I tell most people when they ask me about my situation, is that the best part of my iPad as my computer is that it is still an iPad. Sure I may use the keyboard to type lesson plans, papers, keynotes, etc. But when it all comes down to it, it’s an iPad. And with the introduction of swipe up from the bottom, flipping from a split view to my browser and back and then using slide over view to add marks in numbers is seamless. It’s nearly as fast as command - arrow. @ " We discovered that iOS only recognizes and is able to import files that are within the DCIM folder and have names that are exactly 8 characters long with a three letter DOS-style suffix." Well, I'd been wondering if my USB-C external SSD drive could be used with this new iPad Pro. Looks like you've answered a resounding "No" to that question. If you have a USB-C external SSD then you have also a computer. Attach that SSD to your computer, there are a lot of file transfer utilities in AppStore, download one, and transfer files to/from your iPad/SSD. ”I don’t have a computer”. Then why do you have a USB-C SSD drive? Hey everyone... go over to https://bugreport.apple.com/web/ and submit a bug demanding that Apple add external drive support to the Files app. It's ridiculous that it's not there. You can plug in any USB drive but you can't get to the data which is just dumb for a "laptop replacement". If they add USB drive support to the Files interface, it would make it a much more viable alternative for a lot of people. There are external flash drives that work over the Lightning port of previous iPad models. These come with their utility app that integrates also with the Files app and the Share sheet. We can expect USB-C versions of these flash drives, this is just a matter of time. This is just not true. Apple has provided file exchange with the computer since the very early days of iOS. The cloud came much later. We'll be talking about this in a bit. In short, you can, but that drive has to be formatted FAT with a DCIM folder. There can be other files NOT in the DCIM folder, but only the files that Photos knows how to deal with will be importable. How not to support their own format? iOS supports their whole computer ! Why would people expect an Xcode ‘lite’ on an iPad? I think the latest iPad Pro can handle the full Xcode suite quite well. And better file management. But that goes for the Mac too. I’ve been using my 10.5 for over a year now, software keyboard and Pencil only. I think it is net-net better than a laptop for educational purposes with my kids. I’m not even sure how I could even do it with a laptop for some of that stuff. 1. I ingest assessment test PDFs into GoodNotes, and let the kids take the tests with the iPad and Pencil. This has been awesome. Just awesome. All educational material can be imported into the iPad, and students can just do the work on the iPad with a Pencil. Geography, reading, math, language arts, any kind of educational sheets. 2. I illustrate concepts, do/show math, and write up problems with the Pencil. Infinite paper with perfect erasing. My daughter has to do some math homework on a webpage, and man, I haven’t been so annoyed with something in a while. It was some kind of craptacular HTML/Javscipt monstrosity built for low resolution displays, couldn’t be zoomed, elements of equations where fill-in-the-blank style. It probably makes kids less adept at math than showing them how to do math. If this is where the Chromebook dominated education world is headed, with everything based on web pages, uh, I am definitely having a conversation with the teachers. All my personal usage such as web forum postings, email, messages, note taking, etc. Even diagramming with OmniGraffle and Python scripting with Pythonista. Moving the text cursor has got be easier while flat. I don’t even want to think about how bad it would be to do diagramming while my iPad is vertical, or dragging and dropping files. The file scanning in Notes is also awesome. A lot of people want a trackpad or mouse for their iPad. 1st recommendation is to lay it flat and use the built-in tools. Apple has done a poor job educating users on how to use the software keyboard and doing text cursor movement and selection. 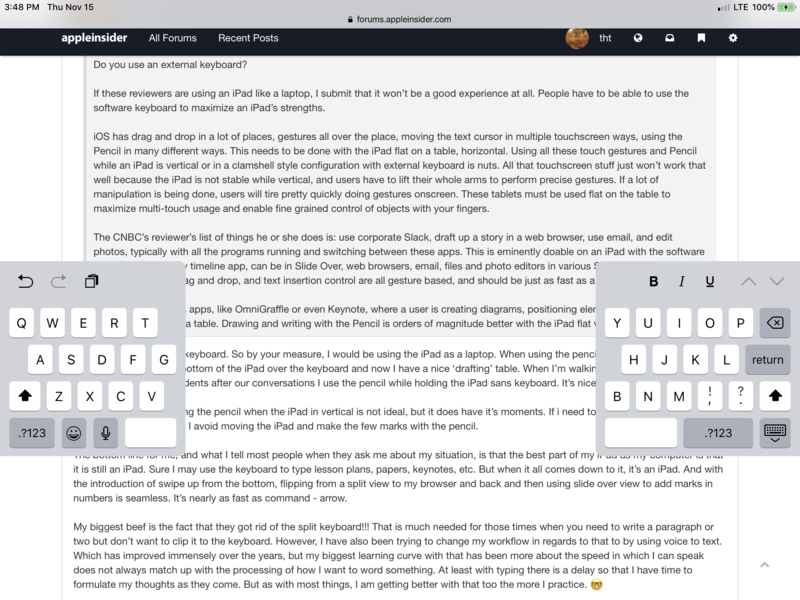 After a year with the 10.5, I think I’d be able to write a thesis length paper with the software keyboard, likely with latex. Would prefer the 12.9 for obvious reasons, but definitely can be done. My biggest beef is the fact that they got rid of the split keyboard!!! That is much needed for those times when you need to write a paragraph or two but don’t want to clip it to the keyboard. I agree, Apple doesn't want the iPad to replace your laptop, they want you to keep all your files in the cloud and use whatever device best suits the job you're doing at the moment. That model is better for Apple than replacing computers, because it means everyone buys 3 or 4 specialised devices. By the way a lot of sites are using video export to show how fast the iPad is. I'm sure that's an interesting and practical test for video/media people, but is it a good choice of test generally? Because everyone knows there's dedicated video processing hardware in many devices so its more likely you're just testing that (and the storage speed) rather than the general purpose part of the CPU. It relates to the export of any large file. For example, for many years, Adobe only utilized one core, one thread, for image save or export. That was slow. I haven’t checked to see what the newest version does. The other missing piece is mouse support. Now I was never a fan of adding it to a touch-based device, but the thing is that people look at the iPad vs. Surface and the surface can support a mouse so they go with that... because they *might* need a mouse. Apple could see a Bluetooth mouse with multitouch and it would be a hit. You can also then use the iPad on a desk without lifting your hand in the air to navigate things. They also need to actually support 4K like they said... that's still not working based on our tests with multiple devices. Also... they need to provide better second screen support. Developers can support this as well, but it would be great to be able to flick apps to a second screen for monitoring things and use the main screen for touch and editing. Do t waste their time with that. While we all know bout this, and many of us want it, it’s not a bug, and shouldn’t be reported as such. Thanks for sharing your workflow. I’ll be giving some of your ideas a go. Good on yah for taking the full plunge and have no physical keyboard. I just tried again and I don’t think you can do that on the 12.9. You should be able to just put your thumbs on and full apart right? Or am I doing something wrong? Enable Split Keyboard first in Settings/General/Keyboard. Also press and hold the keyboard key to merge, dock, etc... Press and hold the world key to open Settings. Also pull up on the keyboard docking button in the corner, that works best for splitting/raising the keyboard. Time for Apple to start production of the iPad Mini Pro! Not YET been updated. Is this really a negative? This happens every time a new screen size comes out. Apple could also put macOS X on it, but it has also chosen to not do that nor is it showing any signs of doing so, at least in this device format. Another bizarre thing to include. Are you suggesting you expect Apple to put macOS (-X) in an iPad, contrary to everything we know about their plans? A lot of people have picked up on the fact that for typical use, an iPad (not even Pro) is a suitable laptop replacement with some extremely minor tricks to learn (like split screen) to use it to its full potential. The iPad Pro is a suitable laptop replacement for people who primarily use a computer to create drawn art -- I predict over time it will also become the tool of choice for photo editing (it's very near that now). Neither iPad is a replacement for a laptop for people who use some very specific notebook-oriented programs and are adept enough on them that there is some real resistance to switching, even if they could. My favourite example from my own life is Keynote: I could totally create my presentations in iPad Keynote (and occasionally have), but I'm more proficient at macOS Keynote due to habit as much as anything, so I keep doing the creation step on my MBP. I can do almost everything else -- revisions, swap-outs, notes, presentations, et cetera -- on the iPad easily. The big issue up till now has been the need for a way to "project" the iPad's screen wirelessly to an HDMI or projector if I don't happen to have my Apple TV with me -- there are wired adapters, but wireless requires an AirPlay device as intermediary. I would love to see license AirPlay for video into HDTVs and other devices the way they do for audio, but for now I use the Apple TV extremely successfully for this. Not it trying to be a contrarian, and yeah I know Apple has their iWork suite running on macOS and iOS, so there is a precedent for Apple uniformly supporting its pro apps on their most important platforms. But even if XCode was available on iPad Pro it would be a very distant third choice for me after #1 a full desktop Mac with multiple monitors, multiple pointing devices, and virtual machines and #2 a MacBook Pro. I’m a big proponent of doing software development, almost exclusively, on virtual machines. If you are doing software development on a machine that is managed by someone other than you and changes can be pushed to your machine, VM hosted dev machines are almost a necessity. I do think Apple has a grand vision for iPad that includes much richer gaming experiences and a next generation of lifestyle and productivity apps that heavily leverage artificial intelligence, augmented reality, and machine learning in ways that a conventional keyboard and mouse UI could never deliver. The ball is in Apple’s court to show us some concrete examples of those apps and demonstrate how the iPad is uniquely positioned to bring those apps to us. But today, the iPad Pro and much of what we vaguely know about Apple’s future vision are still promises. One thing that Apple should do immediately, something that should be a quick & easy point-level update, would be adding multiuser account support to iPad Pro. This simple change would allow buyers to amortize the cost of an iPad Pro across multiple users. Apple has done a great job of building an incredible machine that really only excels at content consumption. They tout the processor power, etc, but what's the point if you can do little more than surf the web and compose e-mails? On top of that, Apple's own productivity apps don't even have feature parity with the desktop versions with some critical features missing. The 12" iPad Pro is an impressive machine, but if you're going to expect people to pay $1500 then it damned well better have the same capabilities as the laptops you sell for the same price. For now, there's precious little benefit beyond what you get with the plain iPad for $$900 less. I use my ipad mini on flights and load it up with movies and tv shows, and have no problems playing any file format (mkv et al) and audio format, hevc, x265... and can always get the audio loud enough even on a file with low audio volume encoded on to it - and that's not using any noise cancelling headphones. So for issues with too low volume - what app are you using to play the content? For starters try the free and well known VLC app, although I've used nPlayer for years now. Both these players give you an option of audio boost if you need it ( as well as equalisation). I think it is funny that we are still trying to figure out exactly what the iPad is. I think you are wrong that it is only a content consumption device, however. If you are a graphic artist, or illustrator you may well be using the iPp as a creative tool. Likewise if you deal with inventory, or retail sales. My wife used one for the longest time as a writing tool for script writing. Many people use it to take notes in meetings, and generally use its sketching capabilities for all sorts of reasons. I think to judge the iPad as a useless tool on the basis that a computer is the best tool for 'you', and that the iPad would offer you no discernible advantages is both a little egotistical and ignorant. Why should anyone need a utility to do what any computer should be able to do directly? That's just silly. OK, I suppose it could be done, but it would be a trying endeavor. I've written articles for like 3 hours on a flight with the software keyboard, and that was about all I could take. And, I'd have saved an hour or more if I had a real keyboard. Let's just start with a new iPad mini period! This is one task where an iPad destroys a laptop too... giving presentations. Then you wouldn't have to buy 3 or 4 of them, so it would cost them too many sales. Otherwise, it would have been done long ago. People have been complaining about that since at least the iPad 2. On top of that, Apple's own productivity apps don't even have feature parity with the desktop versions with some critical features missing. Yeah, that's a huge pain, especially when it is the kind of feature you use almost daily. For example, I almost always wait to manage my calendar until I'm on my Mac, as something simple like duplicating an appointment can't be done on iOS. I think to judge the iPad as a useless tool on the basis that a computer is the best tool for 'you', and that the iPad would offer you no discernible advantages is both a little egotistical and ignorant. I think the pushback has come somewhat due to Apple's slipping commitment to the Mac, especially at the lower end of the price range. The message from Apple seems to be... if you're a non-pro Mac user, your new machine is an iDevice. Except that iDevices aren't ready for prime-time to be such a replacement. So, people are frustrated with that situation. I agree, that for some tasks, the iPad is completely up to the task or superior. But, there are still a lot of issues if one is trying to use them as a replacement for a desktop/laptop, as some stuff either can't be done, or is way less productive.